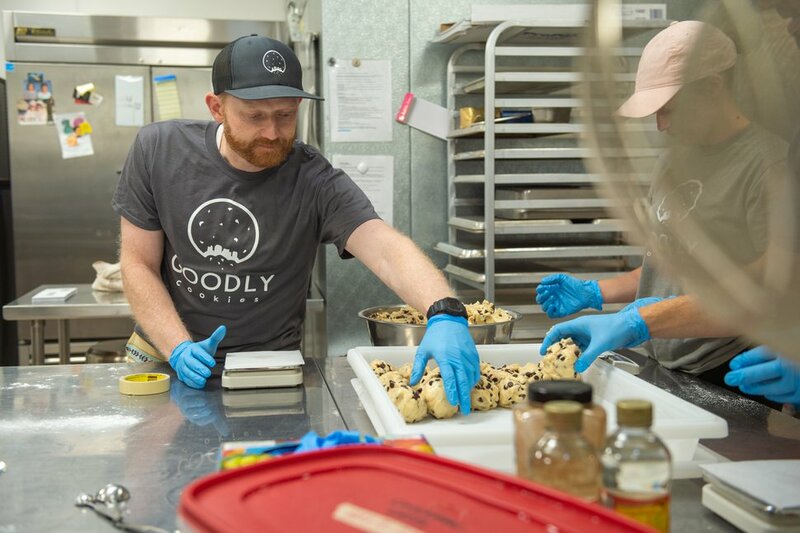 (Rachel Molenda | The Salt Lake Tribune) Clay Rockwood, co-owner of Goodly Cookies, shapes six ounces of gluten free chocolate chip cookie dough into a ball before baking on Wednesday, June 6, 2018. The Salt Lake City cookie delivery service uses Amour Café's kitchen on 500 E and 1300 S in Salt Lake City, Utah. (Rachel Molenda | The Salt Lake Tribune) Goodly Cookies employees prepare gluten free cookie dough for baking on Wednesday, June 6, 2018. Goodly Cookies uses Amour Café's kitchen on 500 E and 1300 S in Salt Lake City, Utah. (Rachel Molenda | The Salt Lake Tribune) Brandon Plewe, co-owner of Goodly Cookies cuts samples of the cookie delivery service's offerings on Wednesday, June 6, 2018. Clockwise from left, chocolate with peanut butter chips, double chocolate walnut, cinna-john and chocolate chip. 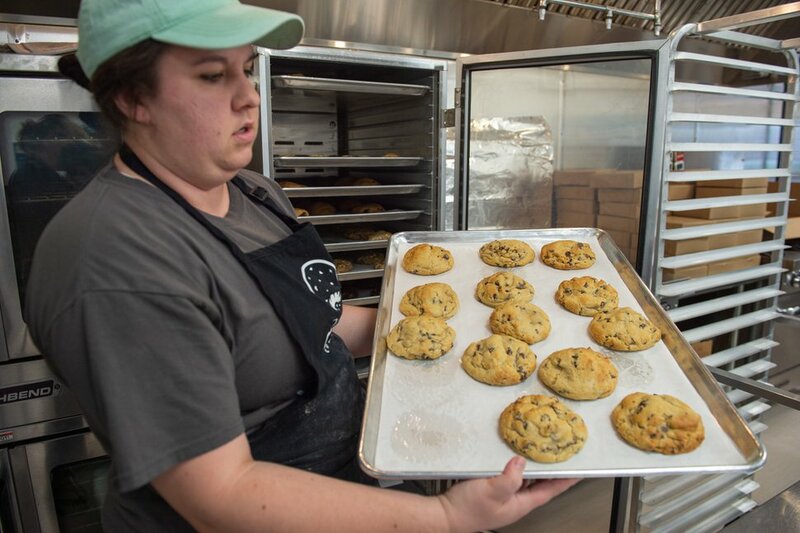 (Rachel Molenda | The Salt Lake Tribune) Hailee Henson bakes gluten free chocolate chip cookies for a delivery at Goodly Cookies on Wednesday, June 6, 2018. The company donates a portion of its sales to the Huntsman Cancer Institute. (Rachel Molenda | The Salt Lake Tribune) Brandon Plewe, co-owner of Goodly Cookies, breaks open a warm chocolate chip cookie on Wednesday, June 6, 2018. Plewe survived a rare form of cancer in his 20s and wanted to give back. The company donates a portion of its sales to the Huntsman Cancer Institute. 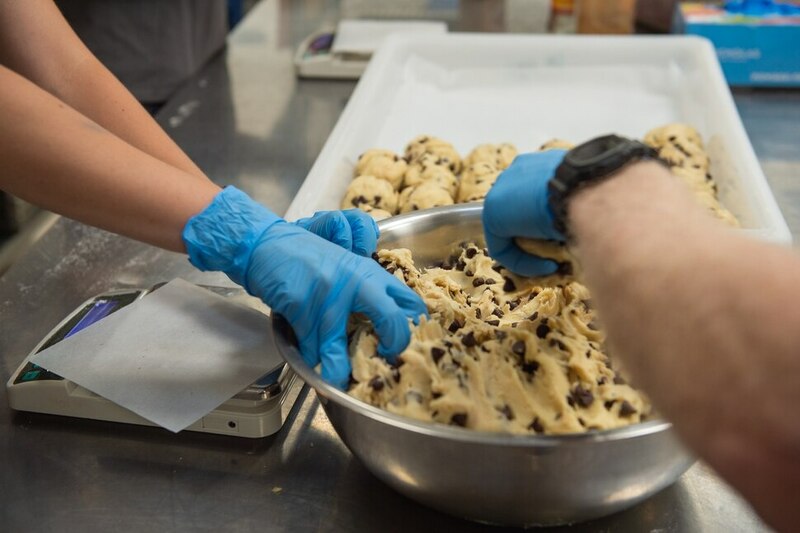 (Rachel Molenda | The Salt Lake Tribune) Brandon Plewe, Goodly Cookies co-owner, Isabell Drake and shape six ounces of gluten free chocolate chip cookie dough before baking on Wednesday, June 6, 2018. The Salt Lake City cookie delivery service uses Amour Café's kitchen on 500 E and 1300 S in Salt Lake City, Utah. 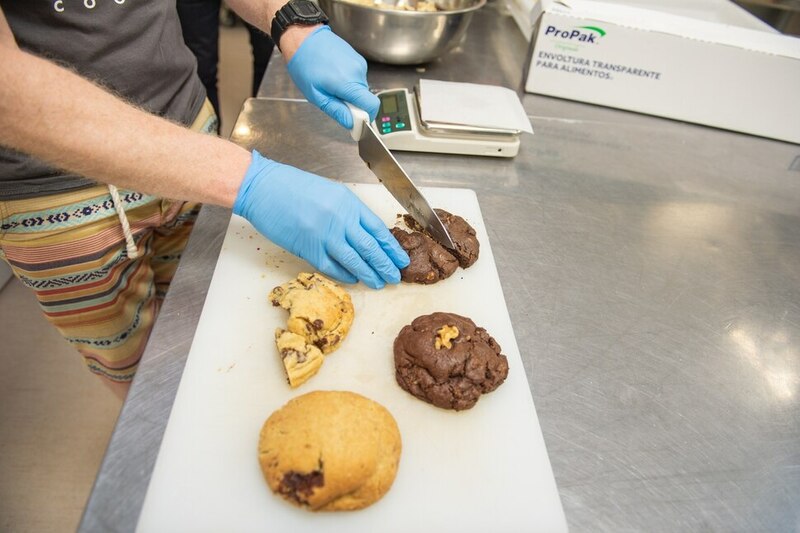 (Rachel Molenda | The Salt Lake Tribune) Brandon Plewe, Goodly Cookies co-owner, Isabell Drake and Clay Rockwood, co-owner, shape six ounces of gluten free chocolate chip cookie dough before baking on Wednesday, June 6, 2018. The Salt Lake City cookie delivery service uses Amour Café's kitchen on 500 E and 1300 S in Salt Lake City, Utah. (Rachel Molenda | The Salt Lake Tribune) Mason McMillen delivers Goodly Cookies to a Brianna Lindsey in Salt Lake City, Utah, on Wednesday, June 6, 2018. (Rachel Molenda | The Salt Lake Tribune) From left to right, Clay Rockwood, Hailee Henson, Isabell Drake and Brandon Plewe work on baking the night's cookies at Goodly Cookies in Salt Lake City, Utah, on Wednesday, June 6, 2018. (Rachel Molenda | The Salt Lake Tribune) Hailee Henson shows off a tray of chocolate chip cookies at Goodly Cookies in Salt Lake City on Wednesday, June 6, 2018. (Rachel Molenda | The Salt Lake Tribune) Brandon Plewe is a co-owner of Goodly Cookies, a cookie delivery service in Salt Lake City, Utah. Plewe, who survived a rare form of cancer in his 20s, donates a portion of the sales to the Huntsman Cancer Institute. Wednesday, June 6, 2018. (Rachel Molenda | The Salt Lake Tribune) Mason McMillen packs up a delivery at Goodly Cookies in Salt Lake City, Utah, on Wednesday, June 6, 2018. (Rachel Molenda | The Salt Lake Tribune) Hailee Henson makes cinnamon chips for Goodly Cookies on Wednesday, June 6, 2018. (Rachel Molenda | The Salt Lake Tribune) Clay Rockwood, co-owner of Goodly Cookies, on Wednesday, June 6, 2018. (Rachel Molenda | The Salt Lake Tribune) Hailee Henson bakes gluten free chocolate chip cookies for a delivery at Goodly Cookies on Wednesday, June 6, 2018. The company donates a portion of its sales to the Huntsman Cancer Institute. (Rachel Molenda | The Salt Lake Tribune) Mason McMillen delivers Goodly Cookies to a customer in Salt Lake City, Utah, on Wednesday, June 6, 2018. (Rachel Molenda | The Salt Lake Tribune) Goodly Cookies is a late-night cookie delivery service in Salt Lake City, Utah. The shop uses Amour Café's kitchen on 500 E and 1300 S in Salt Lake City, Utah. Wednesday, June 6, 2018. (Rachel Molenda | The Salt Lake Tribune) Mason McMillen delivers Goodly Cookies to a customer in Salt Lake City, Utah, on Wednesday, June 6, 2018. (Rachel Molenda | The Salt Lake Tribune) Goodly Cookies is a late-night cookie delivery service in Salt Lake City, Utah. The shop uses Amour Café's kitchen on 500 E and 1300 S in Salt Lake City, Utah. Wednesday, June 6, 2018. Brianna Lindsey was stuck at home with her new baby when she was hit with a craving for a warm chocolate chip cookie. What choices did the young Salt Lake City mother have? There was no time — or ingredients — to whip up a batch of homemade batter. Who has energy for that, with a kid sleeping in the next room? Lindsey did what young and tech-savvy eaters do best — get online and order from one of the late-night cookie delivery shops sprinkled across the Wasatch Front. About 30 minutes later, like an angel sent from melted chocolate heaven, a driver from Goodly Cookies pulled up. Carrying a black insulated warmer — the kind used for pizza delivery — he pulled out a cardboard box containing four large, warm, satisfying cookies. “I just love the gooey, fresh-out-of-the-oven taste,” Lindsey said. Many people in Utah and across the country feel the same way, as late-night cookie delivery services are on the rise. Utah’s warm-cookie craze includes a company called Chip Cookies, which has stores in Salt Lake City, Provo and Boise; Crumbl Cookies, with its original store in Logan and new shops in Bountiful and Cottonwood Heights; and Baked Cookie Box in Logan. While the cookies — and recipes — vary, the basic operations are similar. Customers can walk into a store and buy cookies, or they can order online or through an app for delivery. A box of four large cookies — depending on the company — costs between $10 and $12. Customers also can add cold milk to their order for a few dollars more. Most stores start selling in the late afternoon and remain open late — sometimes until 2 a.m. — to satisfy those cravings for chocolate. At Goodly Cookie, there are several cookie choices, including chocolate chip, chocolate peanut butter, double chocolate walnut, white chocolate raspberry and a Big Cinn-a-Jon, named after Utah philanthropist Jon M. Huntsman Sr., who died in February. The snickerdoodle-type cookie was supposedly Huntsman’s favorite, said Plewe, who works for the Huntsman Cancer Institute. Today, Goodly Cookies donates 1 percent of all sales to the institute to support cancer research. At Chip, which launched in Provo in 2016, there is only one cookie on the menu — chocolate chip. But the company does offer a seasonal flavor each month, said Stephen Wirthlin, who co-owns the company with his brother Chris Wirthlin, sister Sarah Wilson and brother-in-law Sean Wilson. The idea for late-night cookie delivery can be attributed to Seth Berkowitz, who launched Insomnia Cookies in 2004 while attending the University of Pennsylvania. He mixed and baked them in his apartment and delivered them, too. No surprise that the idea resonated with college students, who are experts at staying up late to study — or party with friends. Today, Insomnia Cookie has more than 130 locations, many near college campuses. Its lone Utah store is near Brigham Young University in Provo, a town that has embraced the late-night cookie scene much as other college towns might support beer bars. (Rachel Molenda | The Salt Lake Tribune) Hailee Henson shows off a tray of chocolate chip cookies at Goodly Cookies in Salt Lake City on Wednesday, June 6, 2018. The cookie delivery trend is driven mostly by millennials who don’t mind paying extra for convenience. Also playing a part are improvements to online ordering systems and mobile platforms that make it easy for customers to order takeout and track delivery. That’s part of what Helen Langan liked about ordering from Chip. Langan, who lives in Salt Lake City but works in Lehi, had heard about the cookie delivery concept from her Utah County colleagues. When she learned that Chip was delivering in Salt Lake City, she and her husband made a late-night order after they put their young children, ages 5 and 9 months, to bed. Part of the novelty was tracking the order on her cellphone, she said, watching as the cookies left the store and receiving a text when the driver was close — something akin to Uber. But how do the cookies taste? And the best part — you don’t have to get out of your pajamas to enjoy them. Editor’s note: Tribune owner and publisher Paul Huntsman is a son of the late Jon Huntsman Sr.
(Rachel Molenda | The Salt Lake Tribune) Brandon Plewe, Goodly Cookies co-owner, and Isabell Drake shape 6 ounces of gluten-free chocolate chip cookie dough before baking on Wednesday, June 6, 2018. The Salt Lake City cookie delivery service uses Amour Café's kitchen on 500 East and 1300 South in Salt Lake City.